Good morning and welcome to the last Daily FX Report of 2009. At the end of the year the credit ratings agencies confused the FOREX-market with statements regarding the creditworthiness of Japan and Europe. However, we wish you a successful trading day and a Happy New Year. The EUR traded during the Asia session weaker against the USD and JPY on speculation that the credit rating agencies may downgrade the creditworthiness of some European country’s once again. The Wall Street Journal reported the European Commission said that half of its 16 nations have public debt approaching unsustainable levels. The EUR/USD traded around the 1.4300 level after yesterday’s closing at 1.4354. Furthermore the USD climbed to a two-month high versus the JPY as Reuters reported that Standard & Poor’s said that Japan’s AA credit rating could be threatened if policies fail to stabilize and gradually reduce the nation’s huge debt burden. 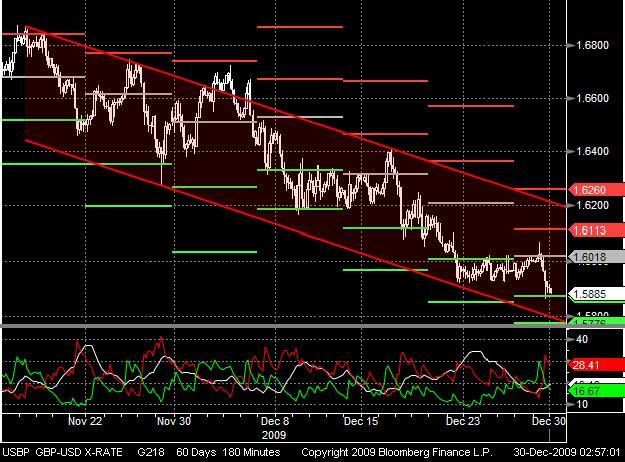 While the USD gained the Gold futures in New York declined on concern that a strong USD will erode demand for the metal as a hedge versus weakness in the currency. The U.S. consumer confidence rose in December to 52.9 points, in line with the median forecast of economists. Another report showed that that the U.S. home prices also climbed in October for a fifth consecutive month by 0.4 percent. The AUD/USD began the trading day with a loss of half a percent and traded in the early Tokyo trading hours around 0.8900. 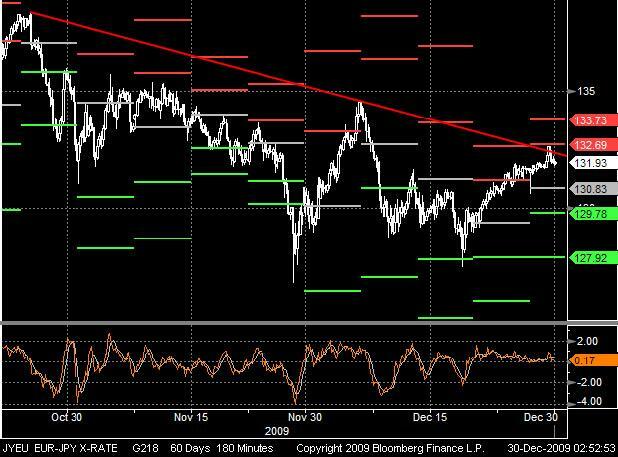 Since the End of October the currency pair has been trading close to a bearish trend line and failed to cross it sustainable for the second time yesterday. It seems that the first weekly pivot resistance point was too strong for the bulls. Now, in considering of a tumbling Momentum indicator, we maybe have to allow further declines near to its pivot point at 130.83. Except one time the GBP has been trading in a bearish trend-channel since November. After the currency pair fell below its first pivot support point last week the bulls tried to recover but failed yesterday at the pivot point and weakened subsequent to the first pivot support point of this week. The DMI may indicate decreasing bearish force, but if the pivot support will also break the GBP could fall to the lower trend-channel line.